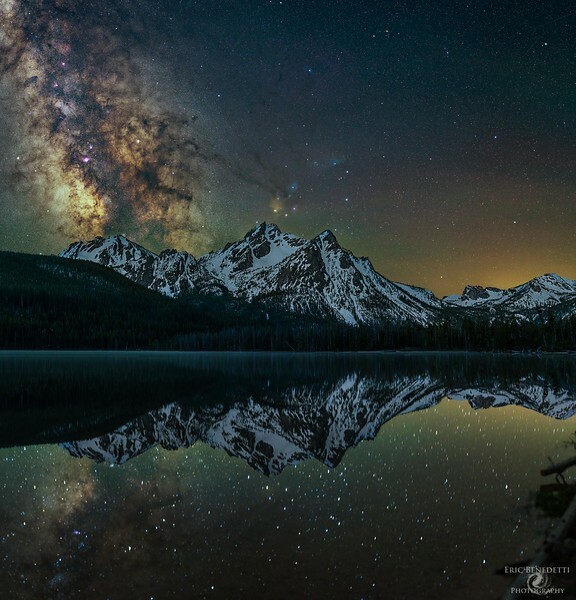 Later after I took the shots of the Milky Way over McGowan Peak and the meadows below it I hurried back to Stanley Lake to get some reflection shots. The air was as calm as I've ever felt it up there, normally there's always a bit of a gentle breeze. The water was seriously like a mirror, just sitting on the side of the lake staring at the water it was almost hard to tell what that it was actually a reflection and not just the sky. I only had about an hour before astro twilight started so I had to limit the width of the shot I wanted to take a bit, especially since I was using the 50mm lens. Unfortunately the core doesn't perfectly line up with the peak, but it is an incredible landscape nonetheless. I took the reflection shots first this time hoping that the stars would align more accurately in the reflection with those in the sky, turned out better I think. 12 shots for this one, 6 for the sky, 3 for the foreground, and 3 for the reflection. Sky shots are 2 minutes at ISO 1600 and f2.8, foreground shots are 2 minutes at ISO 1600 and f1.4, reflection shots are 45 seconds at ISO 3200 and f2 (I have to check this when I get home from work, might have been f1.4).